I hope your week is going good. I've been having a great time being off work for a few days. All the glitz and glitter from Christmas is almost put away until next year and today I'm transforming the living room into a more simple look for the Old Fogies. After arranging and dusting I stopped and sat down for a cup of tea and cookie. 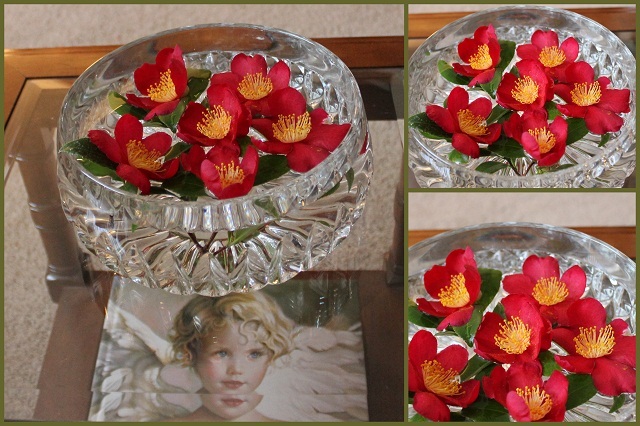 The beautiful 'Yuletide' camellias are about a month late this year, but they are so beautiful I wanted to enjoy them in the house for awhile. 'Roses of Victory' 22 kt. Gold Deco, Made in the U.S. A. These smaller tables sit in front of the love seat and I have my tea books stored underneath for quick reading. Behind the love seat is a sofa table with my new faux Amaryllis I bought from my favorite store and a cloche for my new little mercury glass bird. The black box I used on the coffee table at Christmas is showing off some of my favorite things. And my pet dog is watching everything that goes on around our house. We don't have a real live dog, but if someone new walks in our front door-they think the dog is real. We love him. The mantel is simple too. Old books, a photo of the farmland in England and a pair of antlers. So I have had a tea party for one and a living room make over. BUSY DAY!!! I love your comments and a BIG HELLO to my new followers. Your camilias are wonderful. Your bowl display is simply stunning! 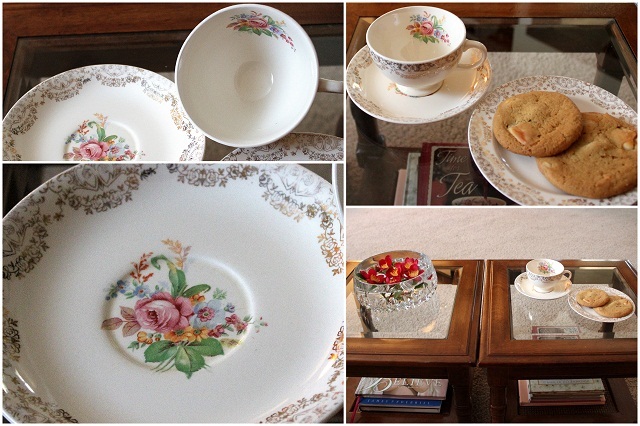 The tea cup set is my favorite style of vintage dinnerware. I did not know Nasco made any like this. Thanks for teaching me something new. Those camellias are breath-takingly gorgeous! I really miss the camellias we enjoyed when we lived in Tallahassee and Baton Rouge. They don't grow well here in central Texas. I also love your "faux dog"! Too cute! Just lovely......and let's face it, sometimes our Tea for One moments are the very best moments we experience. Love your great USA made china finds! And your faux amaryllis looks so real! Love your camellia too, it is stunning. Lovely set up and the tea cup is sooooo pretty. What a lovely teacup! Your camelias are such a gorgeous colour for this time of year. They really would perk up a room. Love your sofa! I'm so happy to have you join me for tea today. Love having you! what you have displayed is lovely! Happy Tea Week! what a nice break from the room make over. Your living room looks really inviting. What a cute dog and it looks truly real. Thank you for sharing your beautiful home and this delicious tea time.